Congratulations to Robbie and Starscent, our two randomly-selected winners of a carded sample of Tauer's Une Rose Chyprée. You will be contacted today with further details. To all the other readers that left your comments and expressed your interest in Une Rose Chyprée, a big thank you for your ongoing support. I encourage each of you to try Andy's new creation when the opportunity arises. 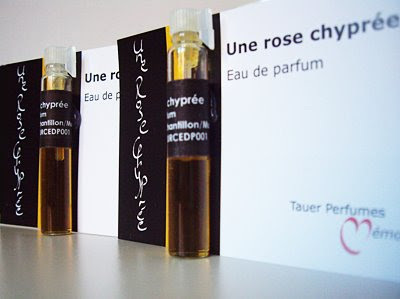 Andy's blog is also a fine place to visit to see what is new in the world of Tauer Perfumes. Have a safe and happy week everyone! Received and tested the Rose Chypree sample which I won. I love it - deep and rich yet soft and lively. I will be a customer. Thank you Dimitry for the gift and for sending it so quickly. I'm so pleased it arrived safely and you find it as wonderful as I! :) Enjoy it Starscent!